The loss of anything we hold dear is always an emotionally difficult time in our lives. Loving your journey through that loss can be a mystery of emotional reactions. Our sanitized world does not like our grief. So we learn to internalize it and distance ourselves from the difficult feelings. We have closed caskets so we don’t have to look upon the face of death. We have funeral services broadcast over the internet so we don’t have to experience all that emotion. We can view from a distance, but not get emotionally entangled in the feelings other people distastefully exhibit. Yet, what we don’t realize is that by burying those emotions, by tunneling underground with those emotions, they will one day surface as bubbles of grief. Then we are forced to deal with them. The ghost of grief! No, it’s better to deal with the loss or the grief-fear face on. Native Americans, among many cultures, have it right according to grief and loss counseling and theory. My native friends permit themselves to actively grieve. In my part of the world, it is not uncommon for the entire community to shut down to honor the time of passing to another world or realm of consciousness. I have been grieving now for 4 months in anticipation of having to put my beloved grandmother dog to sleep. She is not in any pain, but it is difficult for her to move forward, since her hind quarters don’t function well for her anymore. It is fitting that with the onset of winter, she is choosing this time to depart from this world. She has been the alpha female of my “wolf tribe” of dogs for several years. Of all the dogs I have had in my long lifetime, she is the one I love the most. So how can I bridge my grief and loss with my love? I’m a visual learner. It helps me to see a picture of a bridge and to raise my consciousness as to what is truly happening here. Spiritbird sent me this picture to help me love my grief journey. This picture reminds me that the path across that bridge is pretty direct. There is no getting lost. The map of her journey is straightforward. Yes, my world can continue to be colored gray or dismal if that is where I choose to focus my emotional energy. Our emotions are represented by water in astrology and in dream analysis. There will be ripples of emotion along the way. But the emotion can also be soothing and calming to my soul’s journey if that is what I choose to focus on. But look more closely at the picture! While the bridge to death is travelling overhead, underneath is a circle of light. That light can be the focus of all the good feelings and events about my loss. I simply have to reframe when I spiral down emotionally. I can stop my downward spiral of emotions by recalling moments of joy I have experienced with the one I have lost. Then I can recall the time we shared travelling together as a happy time instead of focusing on my pain, my loneliness and my fears. Walk the journey of the spiral of your life into the light of consciousness. You can change your direction of your energy. You are the mistress of master of your own world! Empower yourself! 1. Why have you chosen to remain on a downward spiral of grief? 2. Why do you continue to listen to those forlorn songs that make you sad? 3. What are 4 positive memories you have about this person or animal? 4. What is the most memorable story that you have that makes you positively belly laugh? 5. Who else can you laugh with? Who do you feel contented with? 6. Why have you chosen not to call that person? 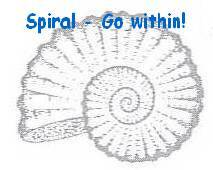 Spiral out and enjoy life again! I love how you tie in visual perception into this coping mechanism. Thanks for your kind words! I will try to use more visuals for those of us who are visual learners. I’m one too! Sherrieh, thank you for your comment on my blog! This visit has been ironic – strange that the same night I communicate with my friends sister (the friend committed suicide two years ago), I find this post of grieving and self counseling. We must be on the same wavelength. I look forward to reading more. God bless. Thank you for your kind words on my blog. As we grieve the loss of our beloved pet, we draw comfort and strength from our relationship with God. He gives us peace in this time of sorrow. Two days from now will be the 13th anniversary (obituary birthday, as he would have said) of the death of a very close friend of mine. I have visual reminders of his existence in my life, and they are very helpful. I think when we literally see proof of our feelings, and as you say, visual reminders of how and why to carry on with our lives, it is affirming and validating. Otherwise, it is all just “in our heads” and then we feel more isolated, which inevitably makes it all hurt more. I do believe faith in a higher power, regardless of one’s religious views helps sustain us during difficult times on our journey through life. After all, God is God no matter what the name one’s calls out. Many people do not appear to realize that. There is only one.